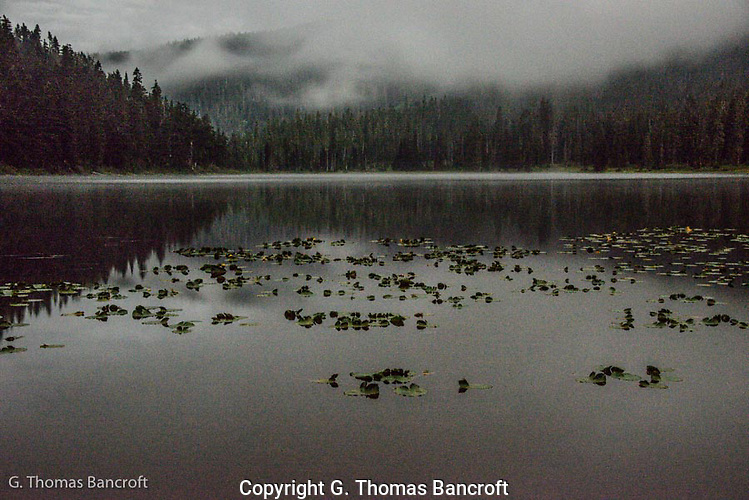 On August 24th, I hiked along the Pacific Crest Trail to the Glasses Lake overlook in the Henry M. Jackson Wilderness. The lake was hourglass shaped and looked wonderful below the rock outcrop. It was partially hidden by trees on the slope below the lookout. Mist was falling, giving a soft look to the landscape. Clouds came across the saddle to my left and drifted down over the lake. You could see the ripples from rain droplets but you had to look really hard to see the rain, it was so fine. Just before the overlook I spotted a large patch of flowers along the trail that was just loaded with bees. After sitting awhile at the overlook, I hiked back to the flower patch to sit amongst the flowers and watch the bees. Purple asters and a grass were in bloom. The patch was a hundred feet long and on both sides of the trail. Flowers stretched back a dozen or more feet from the trail. Hundreds of bees were flying rapidly from one flower to another, generally checking a bloom quickly and moving on to another. Occasionally, a bee would stay longer on a flower, really working hard over the flower, probing repeatedly into the blossom. I can’t imagine that any of these flowers had much nectar left with the intense coverage. I also spotted a syrphid fly. This fly mimics a bee and initially gives you a startle when it lands on your arm. When I looked closely, I knew it wasn’t a bee because it only had one pair of wings rather than the two pairs that bees have. The competition for nectar was fierce and I suspect as soon as a plant produced new nectar, the first bee there would have it. I was mesmerized watching the menagerie and listening to the symphony of buzzes. I sat amongst them for more than an hour. 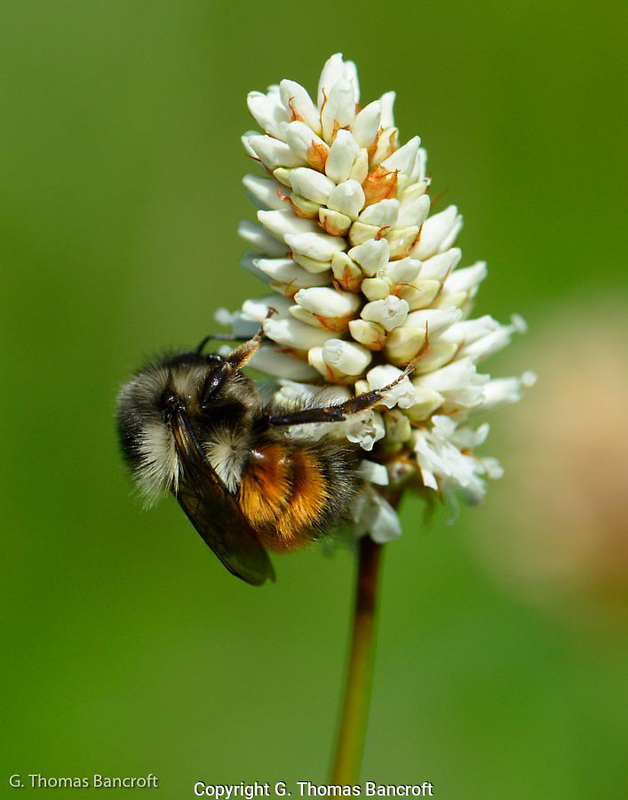 Bumblebees are really important pollinators for native plants, especially at higher elevations (5200 feet here). We have a diversity of species and there were at least three species in this foraging congregation. 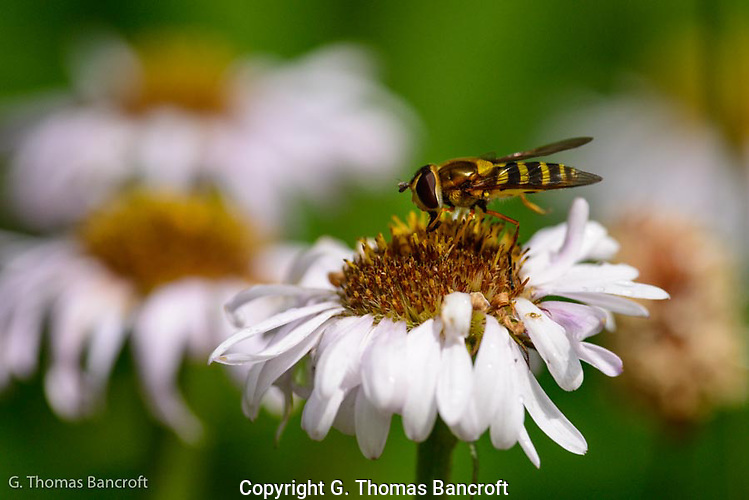 The species distribution varies with elevation and each species has different length tongues and mouthparts allowing different species to specialize on different shaped flowers. They seemed to be generalist here and all going to the same flowers. 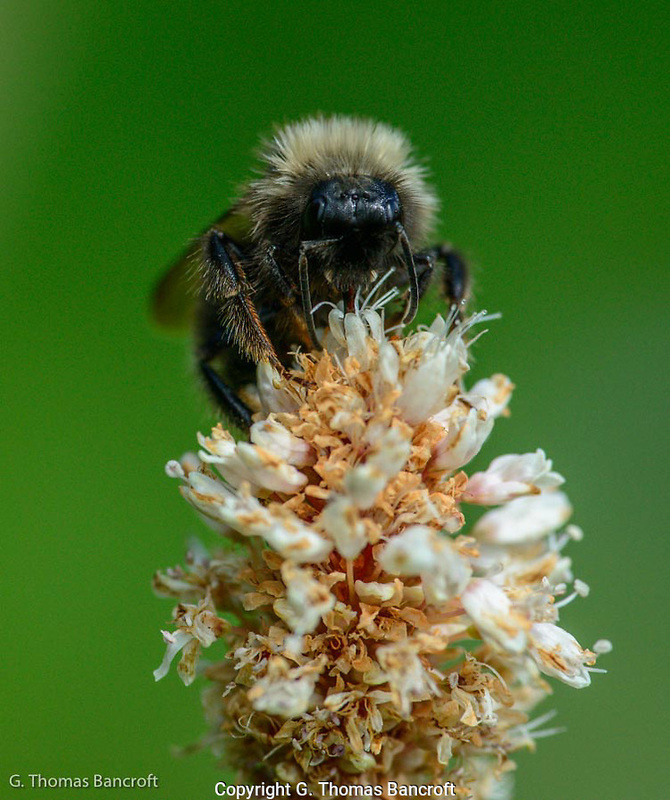 They have pollen sacks on their hind legs and sometimes you can see them carrying bundles of pollen. I did not see any today, suggesting they were having a hard time finding pollen in these well-worked flowers. 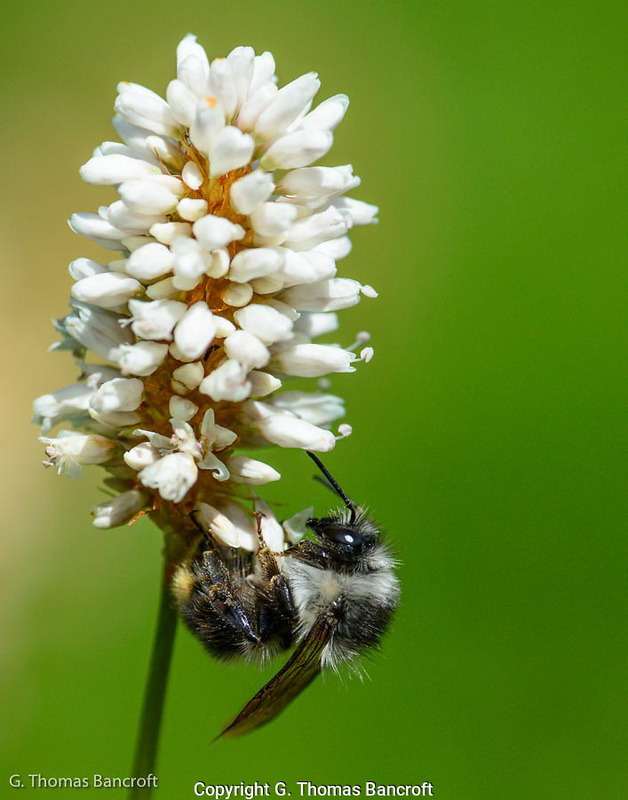 A bumblebee queen hatches in early fall and overwinters in a hole it digs in the ground. It then emerges in the spring and begins foraging while it looks for a suitable nest site in the ground, under a log, or other hiding place. There it builds a wax nest, lays eggs, and begins to build a new colony. Once the first workers hatch, the queen no longer forages but stays at the colony. Colonies only last one year and then the cycle starts over again. Keep you eyes out for bumblebees when you walk past flowers, they are wonderful and fascinating to watch and see. I had to move from my trail seat to let two hikers pass. They never paused to see the fascinating behaviors happening along their path. It is something worth pausing to see. Lake Janus sits below Jove Peak along the Pacific Crest Trail in the Henry M. Jackson Wilderness. 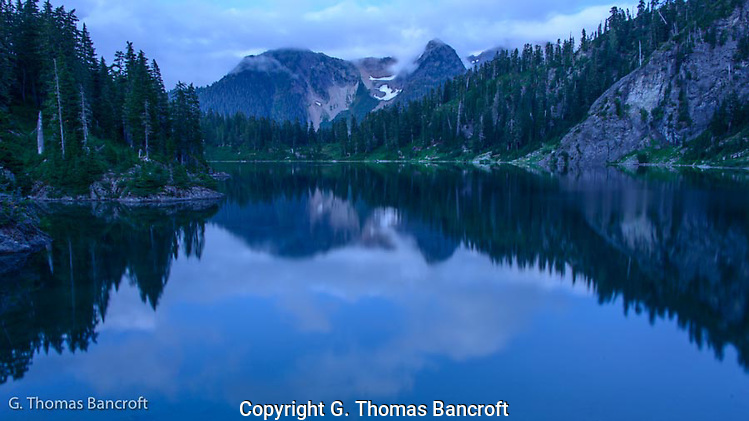 This wonderful subalpine lake is at 4,100 feet and you can camp along the southern bank. Jove Peak rises steeply on the east side to 6,007 feet and a major but lesser hill sets to the west. 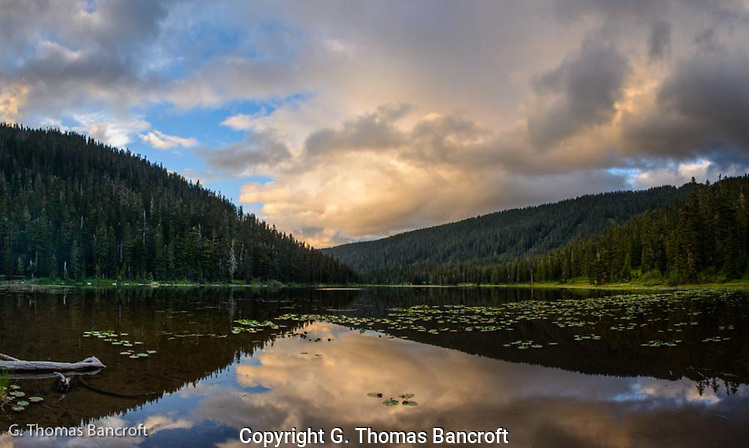 The lakeshore is lined with a mixed forest dominated by mountain hemlocks and subalpine firs with a few silver firs for variety. The understory around the southern edge is a lush growth of huckleberries, blueberries and asters. The huckleberries and blueberries were ripe and delicious in late August. I camped for two nights in a flat area surrounded by trees and only a short distance from the lake. A meadow of grasses, sedges and a few flowers formed a light green expanse just beyond my camp. Pond lilies were scattered across the shallow end of the lake. Small frogs, less than half an inch long, were hoping along the shore, some still had small tails, showing they were just finishing metamorphous from tadpoles. A spotted sandpiper landed on a log against the shore, bobbed several times, before hopping down to the waters edge and working along the shore. The setting was sublime and I found a place to sit to watch. An Osprey called loudly and I found it sitting on top of a dead snag along the eastern shore. It flew across the lake, dove for a fish, but I could not tell if it was successful. I decided I would visit the shore in different lights to see how the lake’s mood changed during my stay. I set my alarm for 10PM for the Milky Way and 3AM for the waning moon. The first night, it was cloudy at 10PM so I went back to sleep. At 3AM, the moon was directly overhead fading in and out of the clouds. It was quite eerie and I noticed that I kept looking over my shoulder to see what might be there. I walked down to the lake to see how it looked in the moonlight. 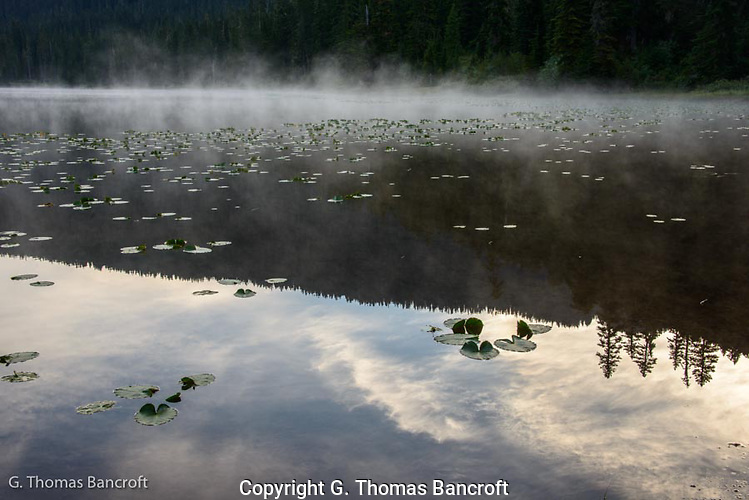 Mist was rising from the lake and clouds were drifting across the forest. A great-horned owl called softly from the forest on the right. The lake in this light was serene and I lost the eerie feeling. I watched for a long time before retuning to my tent. A 10PM, the second night, I found the stars out and bright. 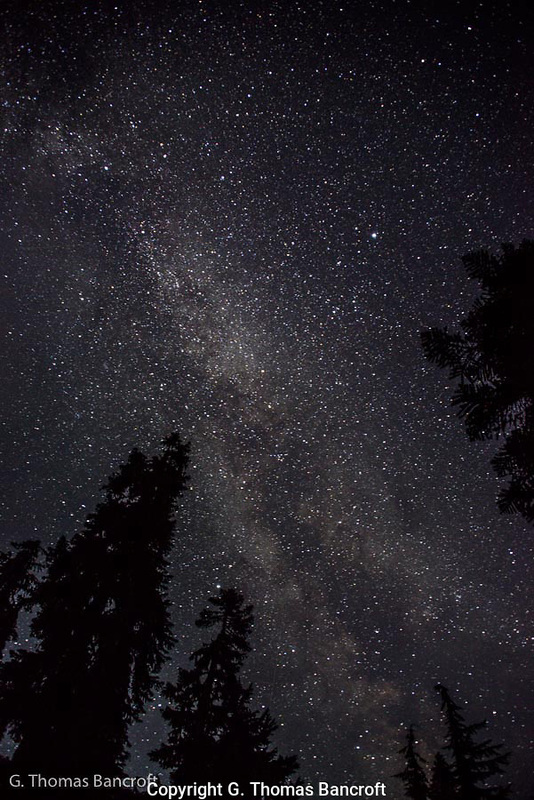 The Milky Way was right over my tent and I stared in wonder as I climbed from my tent. I could see thousands of stars at once. A gas-dust cloud in the galaxy that absorbs light of the stars forms the dark area through the middle of the Milky Way. It was perfect to finally see this. 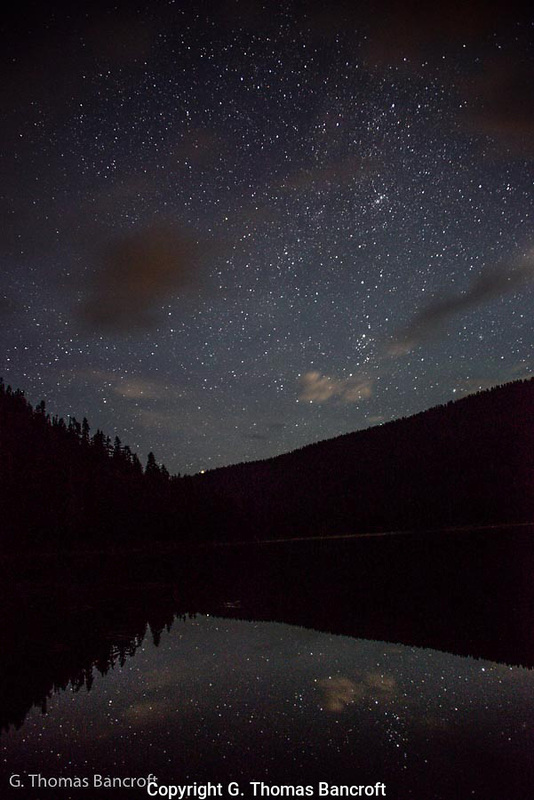 I walked down to the lake, hoping the Milky Way would be reflected in the lake. It was not particularly distinctive but there were still lots of star reflections. The air was fresh and I noticed that a few clouds were drifting by because stars would disappear for a few minutes and then reappear. The long exposure showed the clouds in the photograph. A trout hit the surface by a lily pad and its dorsal fin created a ripple as it swam swiftly to deeper water. The night and the lake was tranquil, the owl called once as I headed back to my tent. In the morning, I walked down to the shore with my tea to sit. Mist was rising from the east side of lake and drifting across. Blue sky with wispy clouds was reflected in the water and constantly changing. A spotted sandpiper called from the far shore. A pair of Canada jays landed in the tree behind me, squawked once or twice and then moved back into the trees. Two red-breasted nuthatches called softly from behind my tent. The scene was mesmerizing and I sat for a long while. I walked back to my camp exhilarated and ready for the hike back out of the wilderness. 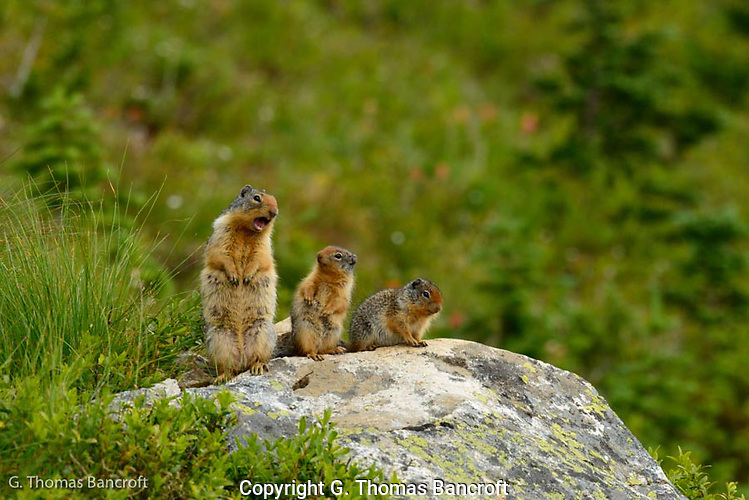 As I crossed the saddle into the Watson Lakes drainage, two pikas gave their typical ‘alarm’ call and ran for their burrows under the boulders. A field of boulders covered the slope on the side of the trail for a 100 or more feet and up the slope a similar distance. Some boulders were the size of washing machines and there were scattered in a pile as if some giant had thrown their building blocks in a corner. 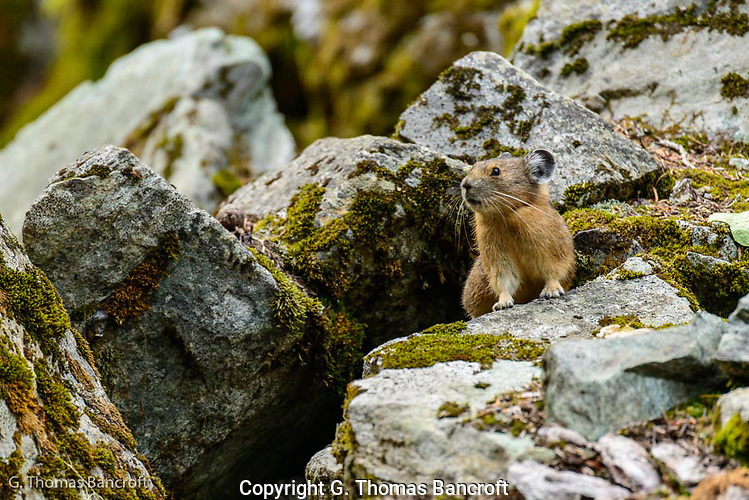 Pikas don’t dig their own burrows and are dependent on rock piles to find safe places to live. I couldn’t stop on my hike into the Lakes so I planned to have more time on my way out. On my way out, I found one of the rocks along the trail and sat to watch the boulder field for a while. Shortly a pika hoped up on a rock 50 feet away, with a mouthful of ferns. It sat, chewing ferns for several minutes before ducking under a rock. Pikas eat vegetation and do not hibernate so they must harvest plants all during the summer to store for winter similar to a farmer “haying” for their livestock. They then have a source of food to eat under the rocks and snow all winter. A second one popped out on a rock closer to me. They have cinnamon-brown fur over the body, white fur on the feet and legs, and gray fur on their large round ears. The ears have a white edge and fluff of fur in front. Their whiskers are almost half the length of their body, sticking three to four inches out from their round face. This individual moved down through the boulder field before disappearing behind a one. Several more came out of their hiding places as I sat and watched. As long as I stayed very still, they seemed to ignore me and go about their business. I sat for 30 minutes, just enjoying seeing these wonderful creatures move back and forth across their home. Pikas don’t like warm climates and have a hard time surviving if temperatures average above 80 degrees for very long. Climate change has been affecting their distribution; unfortunately they have disappeared from many areas in the west. Protecting habitat for them is critical for their continued survival. It was so wonderful to have this chance of observing them. 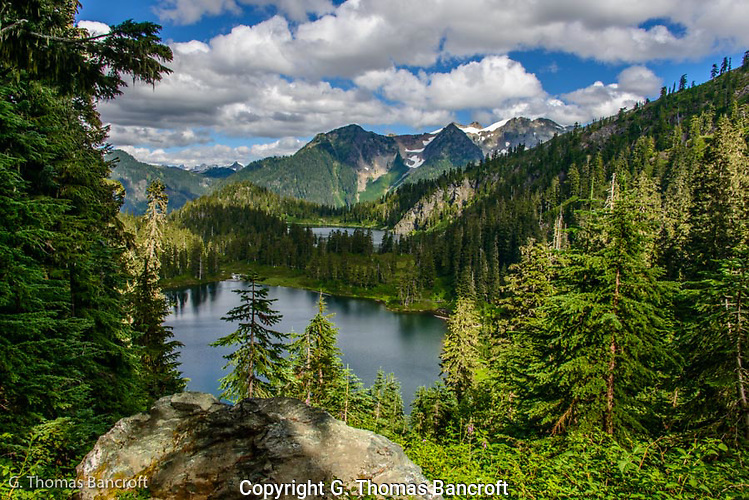 A hike into the Watson Lakes in Noisy-Diobsud Wilderness in the Cascades. On Friday, I hiked into the Noisy-Diobsud Wilderness to spend the weekend at the Watson Lakes. 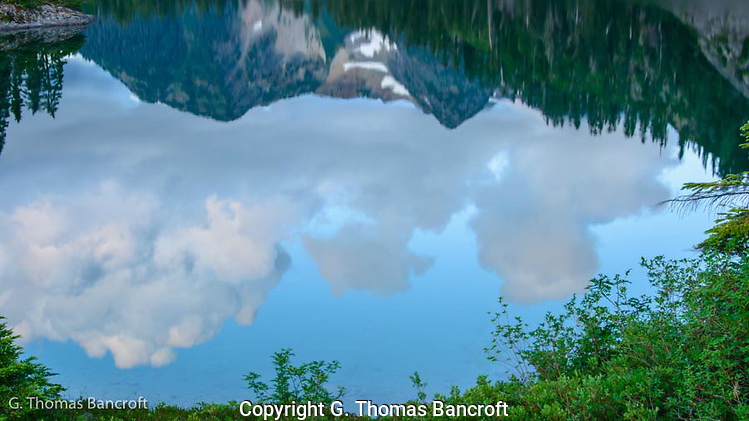 This wilderness is southeast of Mt Baker and you get there by driving 10 miles up a one-lane road from Lake Baker. You can see Mt Baker from the road just before the trailhead. 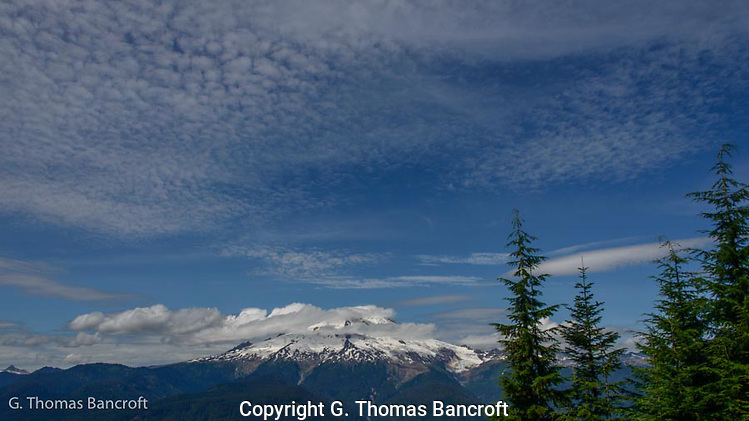 A few low clouds and a wash of clouds painted the high sky over Mt Baker. The trail climbs through a mixed forest of silver firs, mountain hemlocks and western hemlocks, some quite large. I was headed for a saddle between the Anderson Creek and Watson Creek drainages. As I reached the saddle, several pikas ran across rock piles to duck into their burrows. They gave their typical alarm “chirp” before descending into their holes under boulders. Through a series of switchbacks, the trail dropped steeply 500 feet to the first lake. Part way down, I popped out into an opening formed by an avalanche that came off the rocks from above. A thick carpet of false hellebore covered the slope. They had grown to more than three feet high. I enjoy seeing their thick broad light green leaves. It gives a tropical feel to this subalpine environment. I have never seen so many in one place. This opening provided a grand vista of the two lakes. The water was wonderfully blue with ripples from the gentle breeze, the blue sky and white cumulus clouds reflected in the water. A cliff rose from the south side of both lakes, forming a high terrace before the slope continued climbing to Watson Peak. The other sides of the lakes were covered with a mosaic of forests and meadows. Mountain hemlocks with a scattering of subalpine firs and silver firs dominated the forest. Heather and blueberries dominated the meadows with rushes, mosses and grass in the wetter spots. The valley drops along the north side of the lakes toward Noisy Creek. When a mosquito flew into my mouth, I realized I had been staring at this scene for some time. I collected myself and headed down the trail, excited to see what I would find. The cumulus clouds reflected brilliantly in the lake. Ripples from the breeze added soft texture to the clouds. The reflections constantly changed as the clouds slipped across the sky. An osprey called briefly down the lake and I watched as it hovered searching for possible fish near the surface. Eventually it flew around an outcropping along the shore and I lost sight of it. My gaze returned to the reflections and I realized how bliss I felt standing at the edge of this magnificent lake. 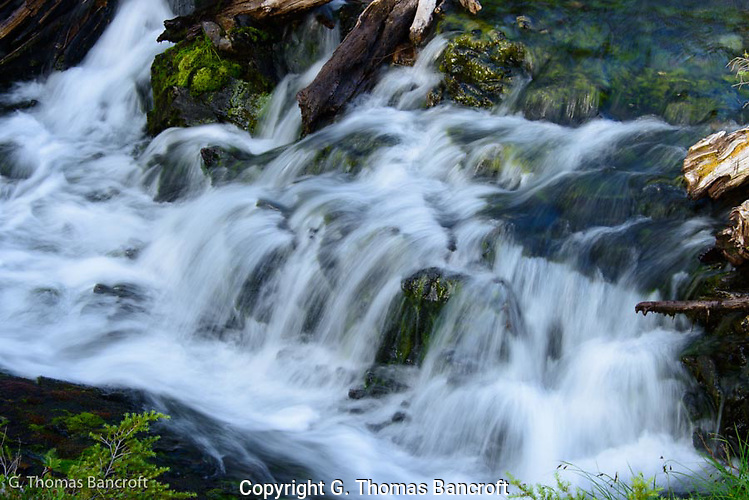 Two waterfalls on the bluff to the south caught my attention and I began to hear the lovely sound of running water. Small snowfields were still in depressions in the rocks high on the slopes and from each a stream trickled down, water tumbling off repeated ledges in a series of steps before flowing into the lake. 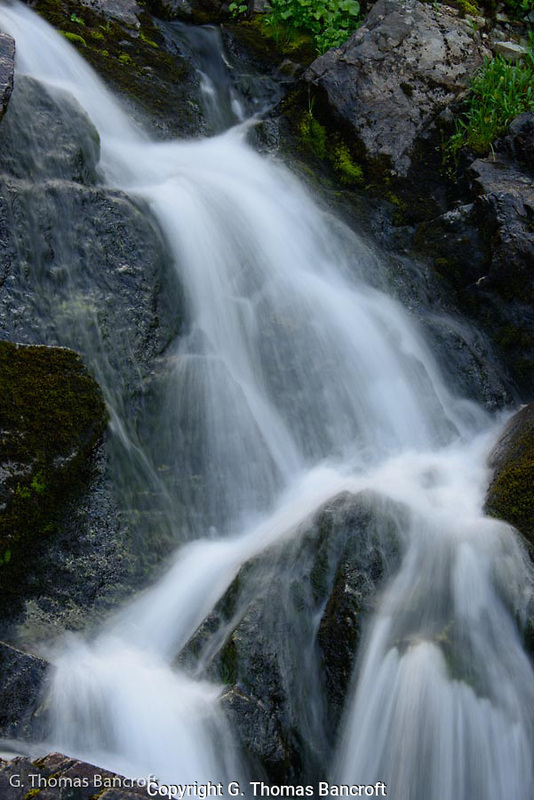 I realized that the louder music of cascading water was coming from the north and I went to investigate. Both lakes had outlets that merged into a larger creek just down slope from the eastern lake. Large drift logs were lodged against each outlet, forming bridges to cross the streams. On each the water tumbled over a series of ledges forming a delightful cascade. I scrambled down the slope through a mosaic of heathers and blueberries to get a closer look. Old flowers still clung to some of the heathers but best of all, ripe blueberry fruit was everywhere. My pace slowed as I paused to eat as many of these deliciously sweet morsels as I could. I finally sat just above the junction of the two creeks, eating blueberries and listening to the soothing sounds of the water flowing down stream. I camped on a small knoll between the two lakes. It gave me a great panorama of the eastern lake. From my tent, only a few scraggly hemlocks blocked part of the lake. As dusk started to develop, I strolled down the rise from my campsite to the edge of the lake. The sun had set half an hour ago and had dipped below the mountains well before that. We were entering l’heure bleue, the blue hour, and it should be very serene to enjoy watching the lake drift into night. I love watching twilight develop and pass over a wilderness lake. I found a place to sit by the water. A light breeze was blowing across the lake rustling the needles of the mountain hemlocks behind me. Several waterfalls were along the cliff to the right, each creating its own gurgling sound as the water tumbled over rocks. The outlet to the lake was off to my left and the water tumbled down a series of rapids dropping a hundred feet in a couple of dozen feet. Mountain hemlocks with an understory of blueberries and heather lined the sides of the lake on each side of me. Insects were humming in the background. Mosquitoes buzzed in my ear as I waited for darkness. As twilight progressed, I spotted a little brown bat swooping down over the water and hit the water briefly probably catching an insect rising to the surface. Trout had been hitting the surface for several minutes suggesting that an insect hatch was in progress. Suddenly, four more bats joined the first and they flew back and forth hitting the surface on every few passes. They flapped gently and rhythmically on wings about as long as swallows but broader. Several more fish hit the surface as I watch the bats. Slowly the darkness settled onto the lake and I could no longer see the bats so I rose to head back to my tent, a wonderful wilderness experience. I rounded a corner on the trail in the Pasayten Wilderness to hear a persistent “chirp chirp”. It took me several minutes to locate from where the “chirping” was coming. The mother was standing amongst thick grass, looking straight at me. Three young kept coming out on a rock, looking around and then scurrying back into the bush. After about 5 minutes the mother, hurried down to the rock where she took up an upright stand and continued the “chirp chirp”. The young joined her but appeared to not recognize me as a danger. They kept looking around and staring at the mother. It was great to watch.